We moved into this house nearly 21 years ago, so with the Gazette now celebrating it’s 100th issue this was when it was in the early days. That year’s December edition of the Gazette was one of the first things to come through the door after our arrival and it felt like a personal welcome to the village. Back then PCs were in their infancy and digital cameras had not yet arrived. With all the advantages that these technological advances bring, producing the Gazette must have been quite a different process than it is today. There have also been changes in gardening over the intervening years with more emphasis on environment and climate concerns. Some plants and styles of planting have lost favour and there is now much more emphasis on encouraging water saving and using organic methods, or at the very least, minimal use of chemicals. I try my best to take these into account when working on, and planning for my garden. Of course I have made many changes to the garden since taking it over all those years ago to make it my own. There are still some plants, now well into maturity, that were here when we arrived and I would not be without them. One of my favourites of these original plants is winter jasmine. It is always a joy, when all other flowers have succumbed to the first winter frosts, to see the bright yellow flowers appear and know that there will be flowers continually until well after the spring bulbs of the following year have appeared. I have found that it does not need a great deal of maintenance, just benefiting from a good prune in the spring once the flowers have eventually faded. Branches which trail on the ground readily set root and so it is easy to get new plants to move around the garden or pass on to others. I also enjoy cutting long sprigs to brighten up Christmas foliage decorations, these last longer if picked whilst the flowers are still in bud. Another favourite that I have retained and encouraged is ivy which now entirely covers the side wall of the garage and makes up half of the back boundary of the garden. 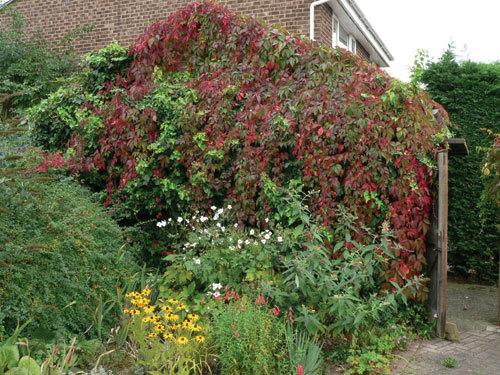 There is also Virginia creeper planted here, again there when we moved in, and this gives a beautiful, if rather brief show of colour as summer changes into autumn. These first changes in colour very gradually appear towards the end of August, serving as a timely reminder that summer is nearly over, but the promise of the bright colours to come are some compensation. Also present when we first arrived was a climbing rose up the front of the house and I found a faded label there announcing it to be ‘mermaid’. This rose has rather lovely pale yellow single flowers with golden anthers which are borne in groups over a long period in summer and into the autumn. It is rather unruly and takes some taming but does not suffer if given a severe pruning, which I have done in either spring or autumn, it doesn’t appear to bother the plant too much when. There are some more roses and a honeysuckle which have also been here longer than us and I intend to keep. Over the following years there will no doubt be more changes in the garden but there these plants are old friends and it would change the garden too much not to have them with us.